This is for the bakers………. I always have 3 kinds of butter in my fridge – whipped, non-dairy and stick. 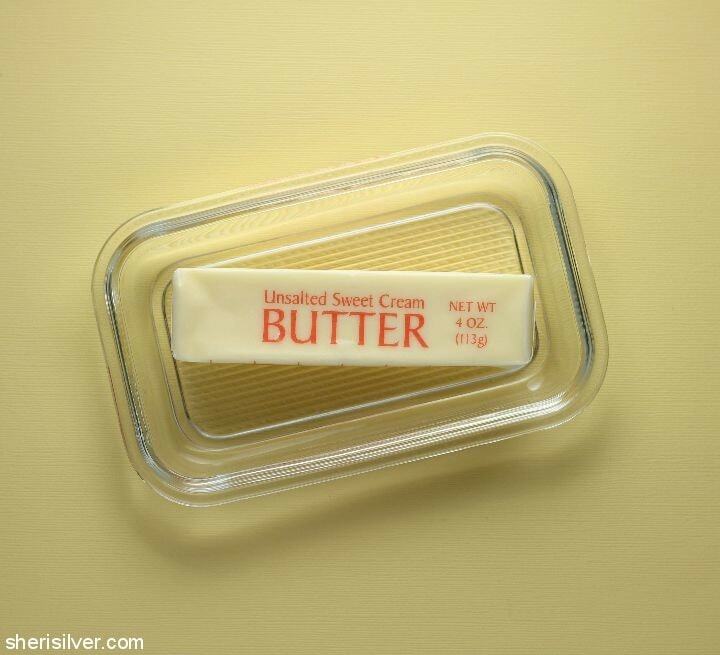 The first is my “eating” butter – for toast, bagels, waffles, etc. The second is for preparing dairy-free and vegan recipes. And the third? That’s my “baking butter”. Unsalted stick butter is what I use for all recipes that call for butter, and it’s typically called for by the tablespoon. So years ago I started keeping a stick in the fridge that is pre-cut into 8 tablespoons (I’ll even do 2 at a time during the holiday baking rush). This allows me to quickly take out exactly what I need for a recipe, without having to dirty a knife or a cutting board. 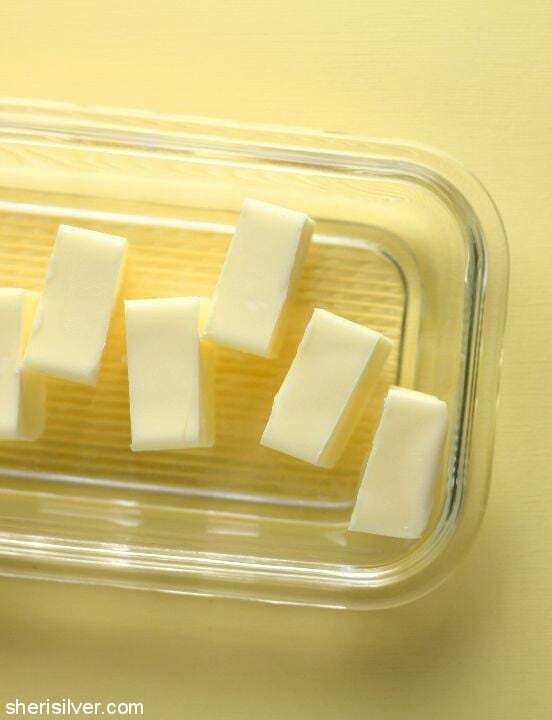 It also gives me a head start on getting the butter to room temperature, as it’s already in smaller pieces – and melts more quickly and evenly too, if that’s what’s called for. What do you think? Is this something you’d do (or maybe already do)? Do you like these tiny time savers (like this, this and this)? And what are your favorite short cuts? So many questions!!! For more kitchen tips and hacks, be sure to follow my Pinterest board (and get baking here)! Thank you, Sheri. I’m addicted to your wonderful tips – at last, I know: use unsalted butter. How long does it stay OK in the frig or freezer? Thank you! 🙂 I have to say that I don’t keep butter around long enough to find out! That said if you want to use this tip and don’t bake often just keep it well wrapped in the freezer – it should keep for several months! I stumbled across your blog while searching for a 7-Up cake recipe. I’m so glad I found you. Thank you for sharing your recipes, tips etc. 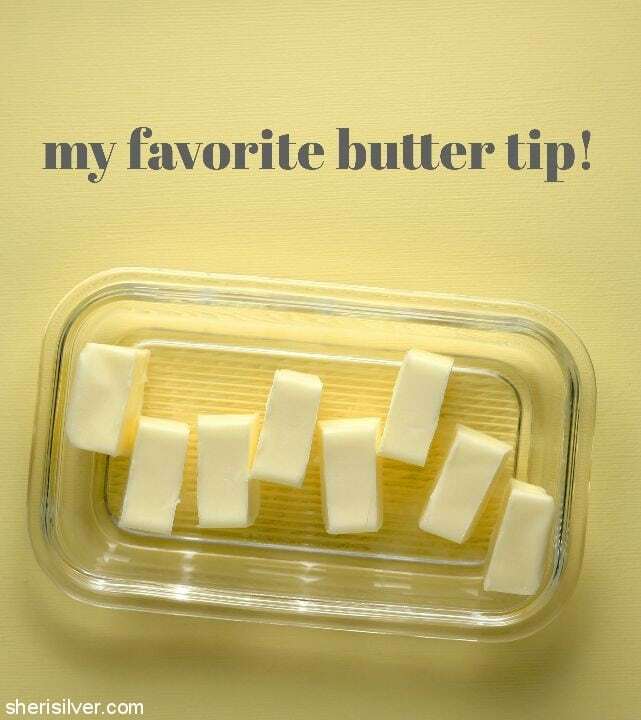 Butter doesn’t last long in my household either, but that’s a great time saving, simple tip. Both my kids (teenagers) have severe nut allergies so we bake all the time. Even if they didn’t, I still would : ) I plan on making your coffee cake soon. Yay! So glad you found me – and would love to know why you were looking for a 7UP cake! 🙂 You will LOVE this coffee cake; please tell me how it turns out! Ha Ha. My mom and I were reminiscing about some of the old cake recipes such as the lemon jello cake and the 7UP cake. I had forgotten all about those cakes so I did a search. I read through several recipes for comparison and that’s how I found your blog. I still haven’t made the 7UP cake : ) I hope to make the coffee cake this weekend. I can tell it’s the recipe I’ve been looking for. Great tip, esp for holidays!